Apple iPhone XS review | What Hi-Fi? Evolution rather than revolution. It’s a phrase that often appears in the world of tech reviews, especially when a new version of an existing product launches. It’s particularly common with Apple, especially when there’s an ‘S’ applied to its smartphones. Take the iPhone XS. 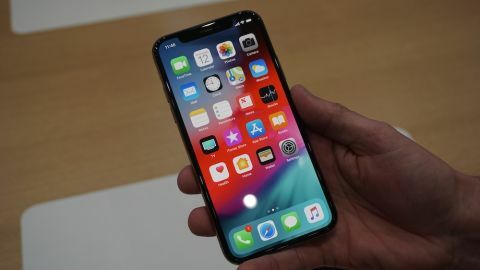 It was always going to be hard to follow the launch of the original ‘X’, a phone that introduced new tech and features to an Apple smartphone for the first time, including an OLED display and Face ID. While the phrase rings true for much of what the iPhone XS has to offer, it still manages to spring a few surprises, especially where its AV performance is concerned. The introduction of an OLED display on the iPhone X set a new benchmark for the brand’s phones. And the 5.8in, 2436 x 1125 resolution screen from that handset is carried over to the XS with equally enticing results. HDR support (HDR10 and Dolby Vision) and pixel density (458ppi) remain the same, but the surprising news is that the picture on the XS is clearer and sharper. Watching Planet Earth II, the screen laps up every last drop of detail, drawing scaly iguana exteriors with unerring accuracy, to the extent that the iPhone X looks soft and out of focus in comparison. As a crab scurries along an iguana’s back, hoovering up pieces of dead skin, the motion is handled confidently. We’re also impressed by the bold, yet convincing colours on the crab’s shell and claws. Reds look bold and natural and contrast nicely with patches of white and yellow on its face. The whole presentation is extremely easy on the eye, and yes, the notch is there if you watch fullscreen, but it's not a major distraction. Switch to an episode of Lost In Space, downloaded to the phone via Netflix (in Dolby Vision) and it’s more of the same. The texture and fine detail on faces and clothing help the phone deliver a wonderfully realistic picture. The clarity adds an extra layer of depth, making every scene inviting and immersive. The inherent strengths of OLED mean the darker moments are inky black but they don’t overpower the picture – the display still extracts an impressive amount of shadow detail. As John and Maureen search through the alien ship, the bright and punchy torchlights carve straight through the darkness. Not only does the Apple iPhone XS produce an engrossing picture, its sonic credentials are equally impressive. Without headphones, the phone’s ‘wider stereo sound’ is a cut above much of the competition at this price. There’s only so much weight, scale and dynamics possible from a smartphone enclosure, but the iPhone delivers more across the board. Not only is the soundstage wider than the iPhone X, it’s also more convincing. Of course, we’d always recommend partnering your smartphone with a decent pair of headphones and the iPhone XS is no different. Even an affordable pair, such as the Klipsch R6i IIs or the Beyerdynamic Soul Byrds will deliver instant improvements. Music sounds solid and tight. Compared to the X, the XS is more dynamic and definitive. Play Jamie T’s The Likeness Of Being and the track flows smoothly. It sounds punchy and lively but the phone still manages to capture the track’s soft undercurrent. Music sounds cleaner and clearer than the X, which allows you to enjoy every last ounce of detail. The guitar, Jamie T’s vocal and even the rainfall in the background are all beautifully rendered. There aren’t many smartphones that are as deft with timing and dynamics. It’s worth noting you don’t get a 3.5mm headphone adapter bundled in the box with the XS, so you’ll either need to have one from your previous iPhone, or budget accordingly (£9 each). Alternatively, you could opt for a pair of Lightning headphones or Bluetooth headphones. Apple sets the bar when it comes to smartphone build quality and iPhone XS continues the tradition. The combination of glossy glass and stainless steel edges give it a desirable feel. There’s no doubting that this is a premium handset. The XS gets Apple’s usual Silver and Space Grey variants but there’s also a new Gold option for those who prefer their iPhone with added bling. The rear panel also features “the most durable glass ever in a smartphone” – not that you’ll be keen to test out that particular claim. Powering the iPhone XS is Apple’s A12 chip, which also powers the XS Max. Apple claims it’s more efficient and more powerful than anything the smartphone market has seen before. The X was nippy, and the XS is most definitely no slouch either. Whether you’re tapping, swiping or sliding it’s quick and slick to use. Apple claims Face ID is faster and more efficient in its new handsets and this seems to be the case – we find it works marginally quicker on the XS versus the X, but we’re talking milliseconds. The main camera gets two 12MP sensors on the rear, one wide angle and one telephoto. New for the XS is the Smart HDR mode which Apple claims will improve the quality of your pictures. The telephoto lens also gets an increase in pixel size compared to the X, which results in better low-light shots, although if your smartphone is to double as your main snapper, you should also consider rivals such as the Samsung Galaxy S10+ and Google Pixel 3 XL. There is a choice of three different sizes, 64GB (£999/$999), 256GB (£1149/$1149) and a beefy 512GB (£1349/$1349). Though most iPhone XS handsets will be sold on the back of a contract, there’s no doubt this is a premium phone, with premium pricing to match. Battery life is a claimed 20 hours for talk time, 14 hours for wireless video playback and 60 hours for wireless audio playback. We find it on par with the X, which means you’ll have enough for a solid day’s use, but will still need to top it up overnight. Battery life has never been the iPhone’s USP, and the XS is bettered by rivals such as the Huawei P20 Pro.